A tight head skates across a pilsner glass’s clear, golden pool. Upon the first sip, its light honey aroma is countered by apple tartness. A delicate balance between sweet malt and light hoppy bitterness is enhanced by a tart, clean somewhat dry finish. I remember sitting in a small bar one night in Columbus, Ohio waiting on the doors to open to see David Guetta perform for the first time. He was playing at a REALLY small venue, once a church, but the doors didn’t open for a couple of hours. So we went and had a beer at a really small pub. I had a Great Lakes beer. Seemed fitting. I don’t remember which one, but it wasn’t this one. 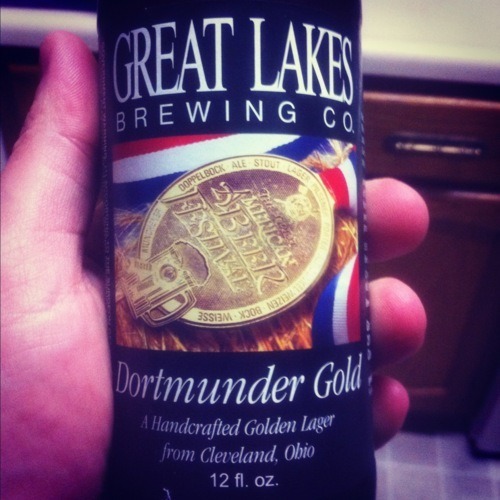 I have never had a dortmunder beer before. I am excited to try it. In the Glass: I wasn’t expecting so much color. The tasting notes made it sound like a bland European beer with some subtle apple overtones. But the beer pours almost orange, and has a very nice look to it. It looks good, so I hope the smell and flavors match. Nose: It smells VERY fruity, and has a simple sweetness to it. People online say this beer tastes like apples. I keep reading that. The sweetness I am getting on the nose would make me think there will be some heavy apple in the flavor. Well… let’s stop smelling and start drinking. Flavor: Drink this beer cold. We are drinking it right out of the fridge, and I don’t think heating this beer up will help. There isn’t much flavor, but the flavor that is there is a high quality and lasting flavor. There isn’t much apple, but there is a simple sweetness that turns dry toward the back of the palate. Swishing it around in my mouth really opens the tongue up, and you get those dry notes all over. I like it. Mouthfeel: The mouthfeel is boring for the first half of the palate, but when the sweetness kicks in leading to a dry finish, I dig it. The burp is good too. This beer has won some medals, a gold medal at that… and while I don’t think it’s THAT good, I would totally get a case of this for a Saturday night at home. Aftertaste: The aftertaste is great. It sits there and doesn’t mess around. It’s dry, almost like what you experience after eating some really fresh fruit in the middle of the summer, and just lingers for a long time. A good three to four minutes have passed since my last sip and it’s still hanging out. I like it. This is a really good beer. I am a big fan of Great Lakes, and while I wish there were more in the book… there are only two on our list. But that’s OK. We go to Ohio every once in a while so we can grab a bottle of this if we need to. We’re actually in the process of planning a trip to Jungle Jim’s. Anyway, I like this beer a ton. Bottoms up people! Oddly enough, I’m not sure if I’m really in the mood to do a beer tonight. I had a great time last night at Birdy’s Bar & Grill doing their monthly beer tasting with Jeff Sample and a guy from Cavalier Distributing. We tasted Yeti and Skull Splitter, and along the way the guy from Cavalier walked in with a bottle of Dark Lord! Oh yeah. Needless to say, Ricky is very sorry he missed it and I got to taste it before him. We have acquired a bottle for 1001 Bottles that is sitting in our fridge right now but neither of us had tried it before. It’s… well, I’ll save that for when we really taste it. And yes, our fridge right now is probably worth quite a lot of money. Lately we have acquired some very hard-to-get beers… a bottle of 3 Floyds Dark Lord, two bottles of Founders Curmudgeon’s Better Half, and two bottles of Goose Island Bourbon County Coffee Stout. Oh, and don’t forget the better part of a case of 3 Floyds Zombie Dust that is sitting next to the fridge. Yeah, we know how to party. But moving on from that… let’s take a look at tonight’s beer. It’s very orange in the glass, with not much head, even right after being poured. Not much lace, either. I swirled it around in the glass, and it clung to it for just a second before sliding back down and leaving a clean-looking glass again. It’s kind of thick looking too, not opaque, but not super clear either. The nose… well, it smells kind of spicy and like orange peel. Not the orange… the peel. An interesting smell. Let’s see how it tastes. Hmm… I’m not quite sure what to think of this. The orange is there; it’s pretty sour. That’s the first flavor you get. I kind of like that. But then it’s got a weird second taste that hits you and sticks through past the finish. Yeah, I’m not a big fan of that. Have you ever used hairspray and somehow opened your mouth while the spray was still in the air? That’s what this beer tastes like after every drink. Sorry, but I’m not into that. The citrusy/sour taste I like, the hairspray taste, not so much. Ricky just said he digs it. Um… I think I’ll leave this one all to him. Probably wouldn’t buy this beer again – I’m not into drinking hairspray.